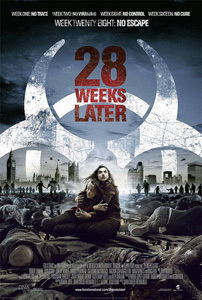 This sequel to Danny Boyle's hit apocalyptic zombie flick takes place 28 weeks after the initial rage virus outbreak. As people begin to repopulate London under the watchful gaze of the US military we are treated to another intense battle for survival as the virus breaks out again and zombies run rampant through the city. There really isn't much in the way of originality here and the twists in the plot feel randomly inserted but if you enjoy gruelling zombie survival movies then you won't find many as good as this. Not as affecting or imaginative as the original but still an enjoyable action packed gore fest and a pretty decent film by sequel standards.